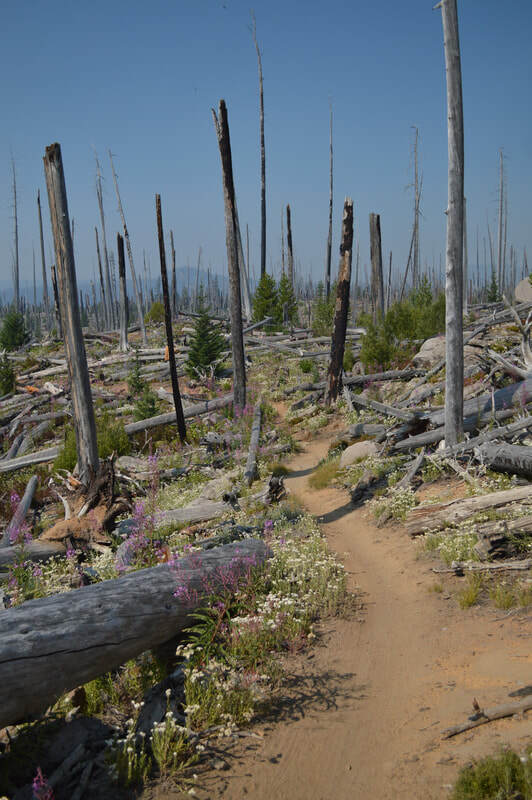 The Waldo Lake loop is a moderate 20 mile trail that goes around the entirety of Waldo Lake. 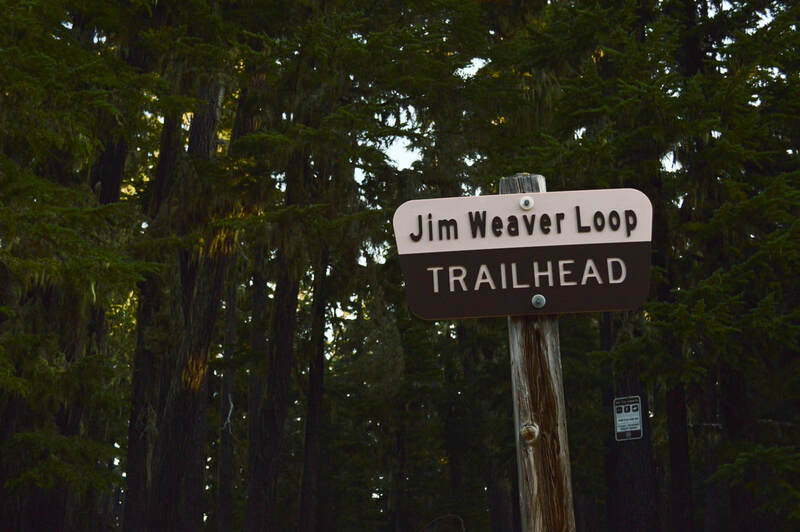 This trail is technically called the Jim Weaver Loop and this is what you will be seeing on all of the trail signs, but most people know it as the Waldo Lake loop. You can start the loop from either NF-5896 that leads to Shadow Bay Campground, or up at the day use area near North Waldo Lake Campground. 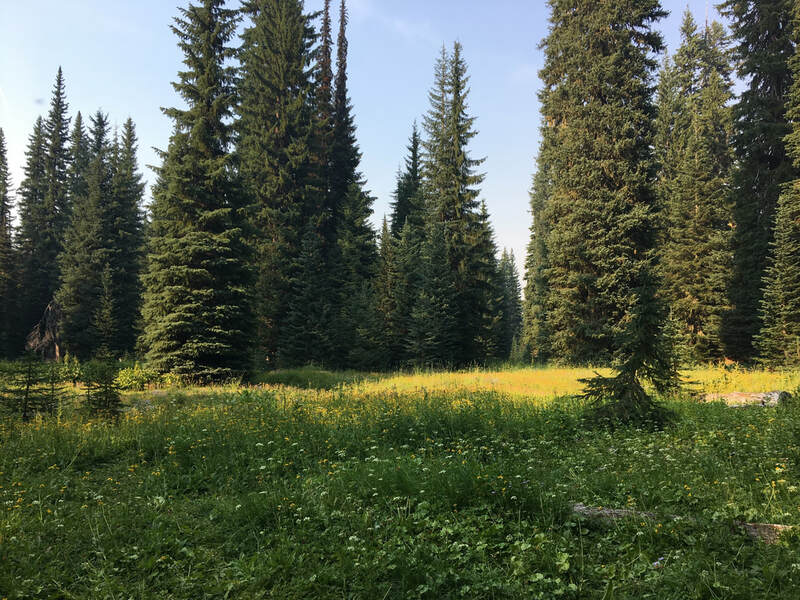 The 5 miles from NF-5896 to North Waldo Lake Campground are entirely through the woods, which is something to consider, especially after you've hiked 15 miles, it is nice to have some views to look at while hiking the last 5 grueling miles of a 20 mile hike. This trail description begins at the NF-5896 trailhead. The first 5 miles of forest are extremely pretty, especially early in the morning when the sun is coming through the mossy trees, and the trail is very level, making it the perfect warm-up. After 5 miles you will cross a road and shortly after you will come to a four-way trail split. Trail #3593 to the right goes to Charlton Lake, and it also goes straight ahead to a Horse Camp. 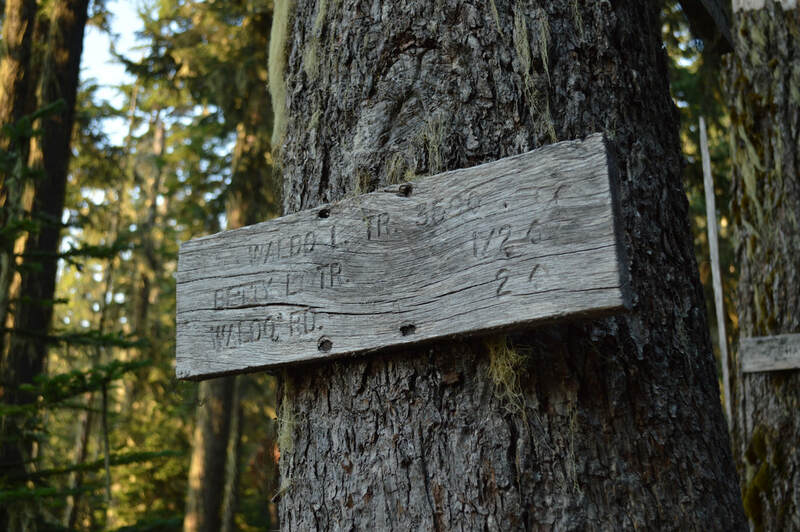 Take the trail that goes slightly to the left, following signs to North Waldo Campground. 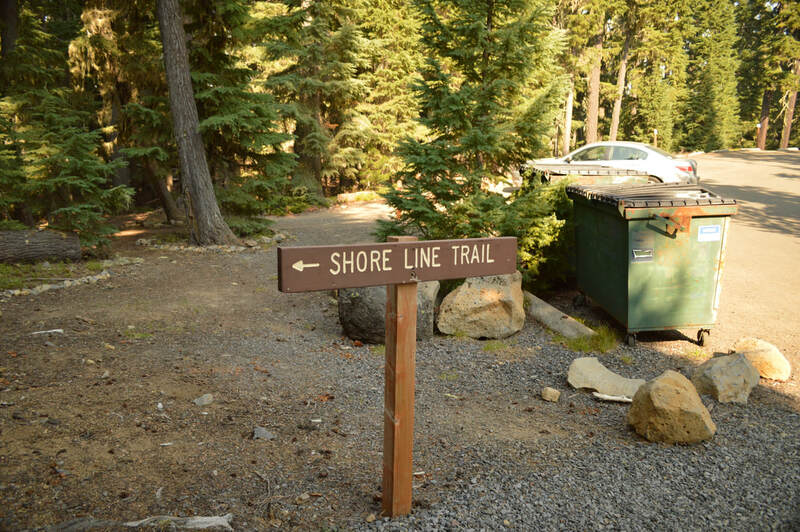 Once you get to the campground you will look for a sign to the Shore Line Trail. 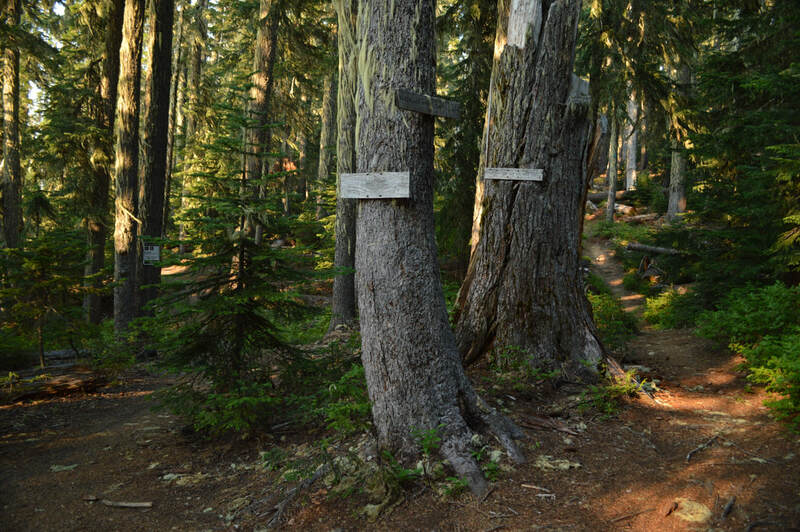 This trail goes parallel with the Jim Waver Trail for about a mile, but it goes along the shore of Waldo Lake. 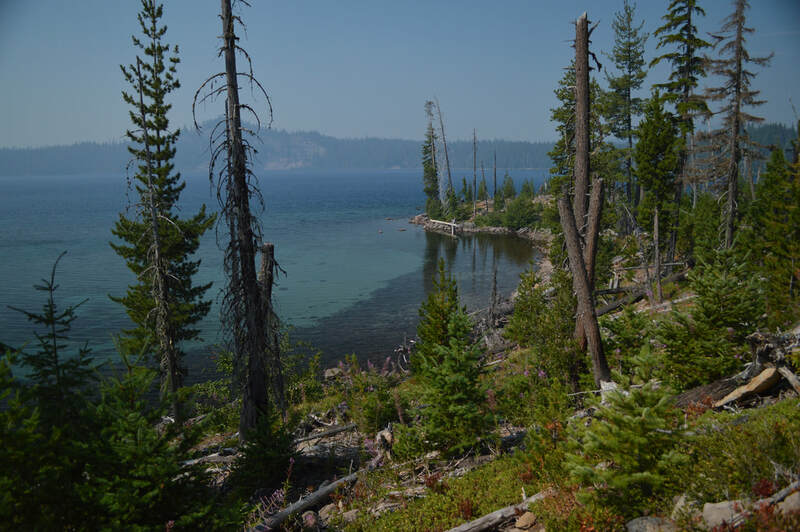 Waldo Lake is the second largest natural non-alkali lake in Oregon with just under 10 square miles of water surface and a max depth of 420 ft.
Once you get back on the official Jim Weaver Loop Trail, you will enter an old burn area. The burn only lasts for about 3 miles. If you are backpacking and would like to extend the hike by 3.3 miles, you will keep your eyes out in the burn section for a wilderness sign on the right leading to the Rigdon Lakes Loop. 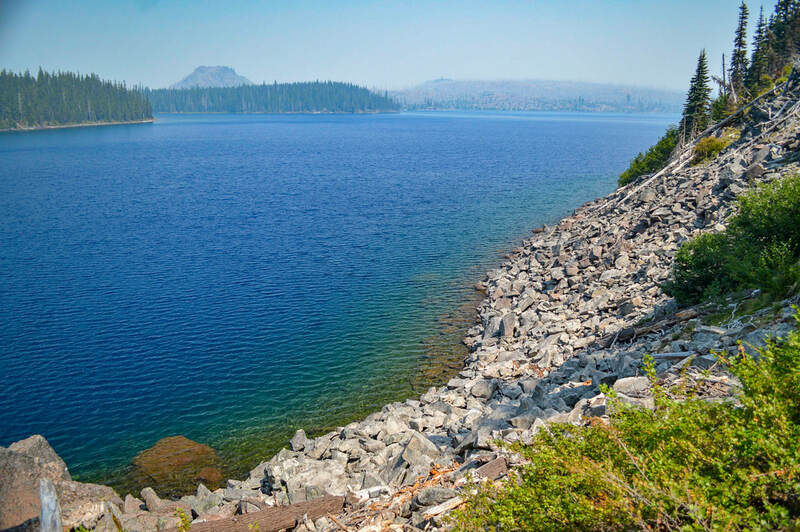 This is a lovely little loop taking you to Upper and Lower Rigdon Lakes, Lake Kiwa and past Rigdon Butte. If you are not doing the Rigdon Lakes side loop trail, continue through the burn area, where you will see a few inlets and peninsulas, here there are some prime primitive camping spots. 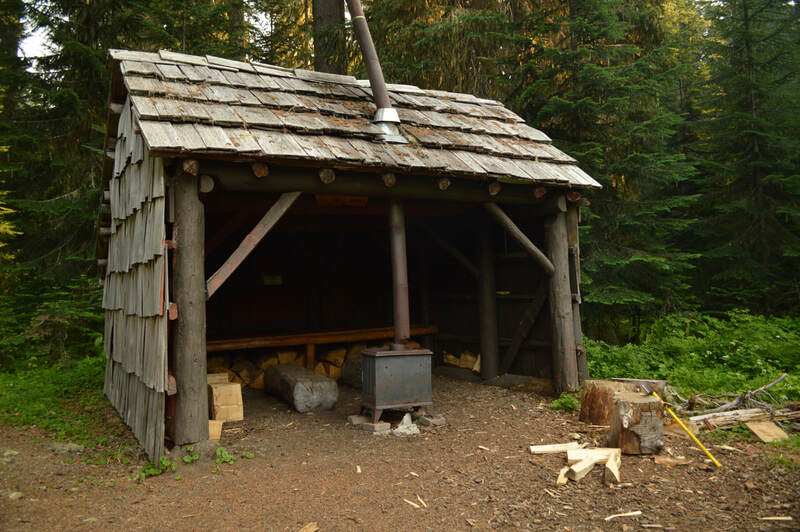 After a total of 3.4 miles from North Waldo Lake Campground you will come to the headwaters of the North Fork Middle Fork Willamette River and you will cross a bridge. There is a camping spot here as well. When you continue on, the trail hugs the shore-line for a bit and it becomes rocky. This is the only section of trail where the terrain is not extremely easy, and there is a 20 ft. drop off on one side. Enjoys these views across the lake though, because shortly after the trail heads into the woods for many miles. 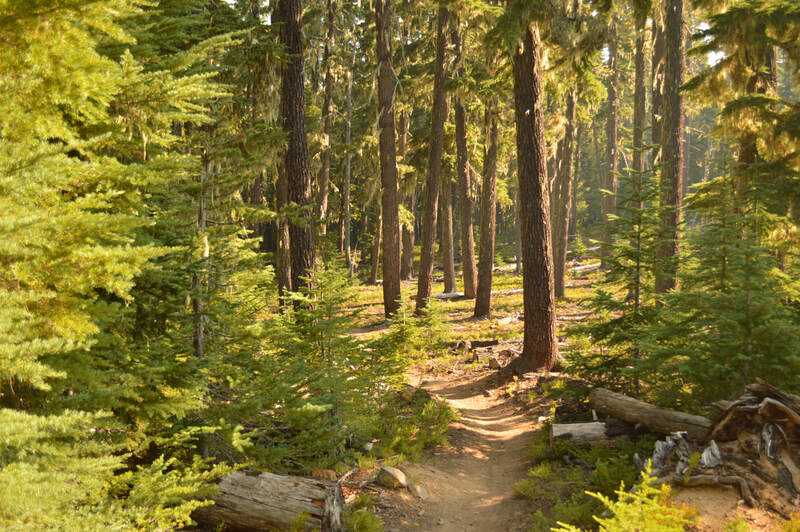 ​Once the trail is in the woods, you don't see much else for about 6.5 miles. There are a few ponds along the side of the trail, and if you are hiking in mid-August, you will want to stop and nom on the abundant Huckleberry bushes that line the trail. After the trail comes out of the forest a bit and back to lake shore, you will come across a the South Waldo Shelter. This shelter has a picnic table outside, a fire place, benches, and a great place to set up tents nearby. Looking out of the shelter you see a beautiful meadow that is filled with wildflowers in mid-July and August. After the shelter you will continue down the trail which now hugs the lake shore again for another mile before coming to a trail junction. Take a right and continue on the Jim Weaver Trail for another .8 miles back to the car. 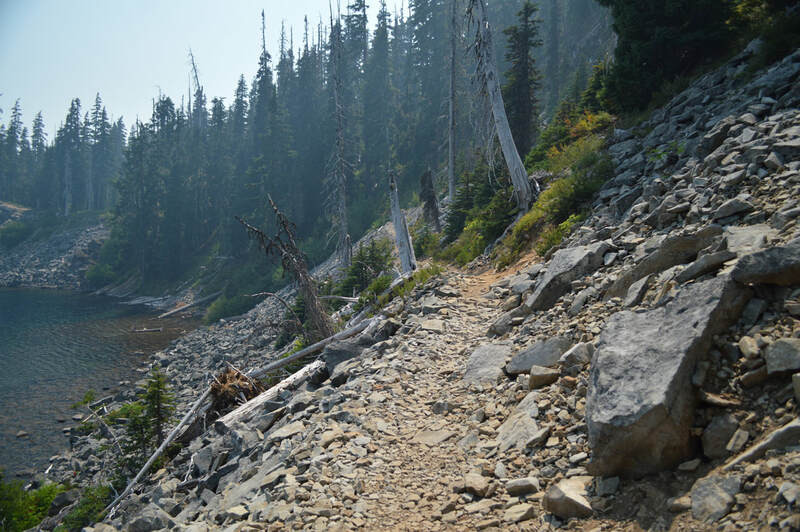 Overall, this hike is very easy and makes for a great first time backpacking trip. The trail is mostly level, gaining only 1,830 ft. in 20 miles, and the terrain is very easy, with the trail being mostly soft dirt. Keep in mind, this is also a very popular mountain bike trail, so you will see some bikes on the trail. Because this trail is so level and generally pretty wide, there are no areas where you have to be extremely cautious about bikes coming down the trail at super fast speeds, but please give them right of way when you do see them. 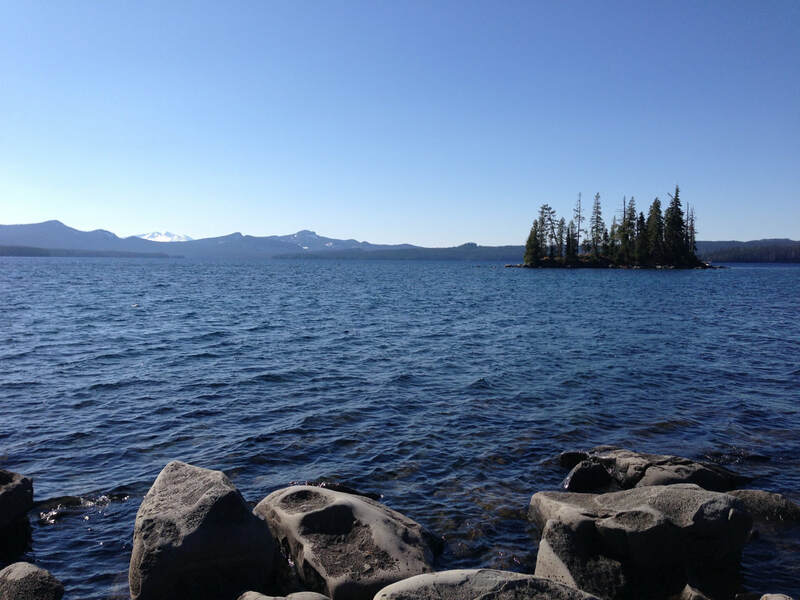 **The whole Waldo Lake area is NOT recommended from mid-June to end of July due to the horrendous mosquitoes here. If you come here during this time you will most likely find the area deserted, and once you step out of your car you will know why. Nowhere else in Oregon are the mosquitoes as bad as they are in the Waldo Lake area. (Best time to go is end of August through October. Avoid mid-June to early August because of horrendous mosquitoes in this area). 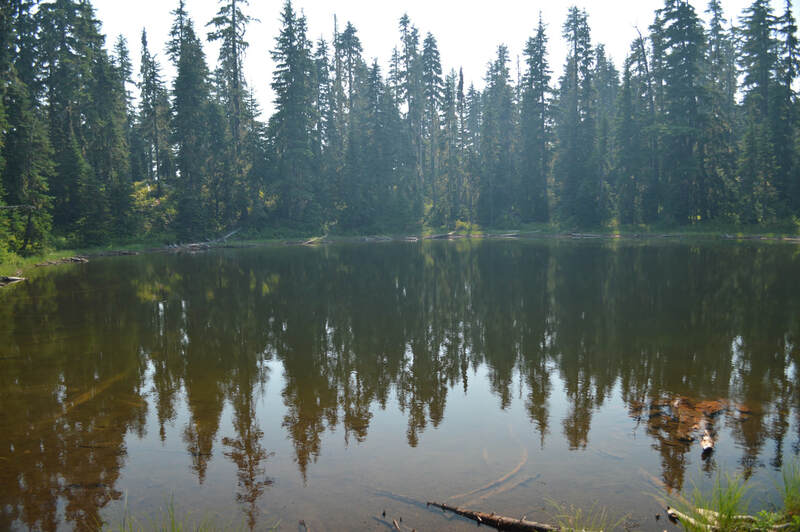 ​Directions: 62 miles east of Eugene, or 3 miles west of Willamette Pass on highway 58, turn north at the sign for Waldo Lake. Continue on paved Road 5897 for 6.8 miles and turn left at Shadow Bay Campground sign and continue about 1 mile until you see a trailhead sign on your right. To start from the North Waldo Campground Day Use area, continue on Road 5897 for another 6.2 miles past signs for Shadow Bay Campground and then follow signs for Boat and Swim Area at North Waldo Campground. You will need your Annual Northwest Forest Pass in order to park in the day use area, or you can pay $5 at the parking lot.